4. Quick lock, release and recoil by using 2 separated color-coded buttons control each dog individually. 5. 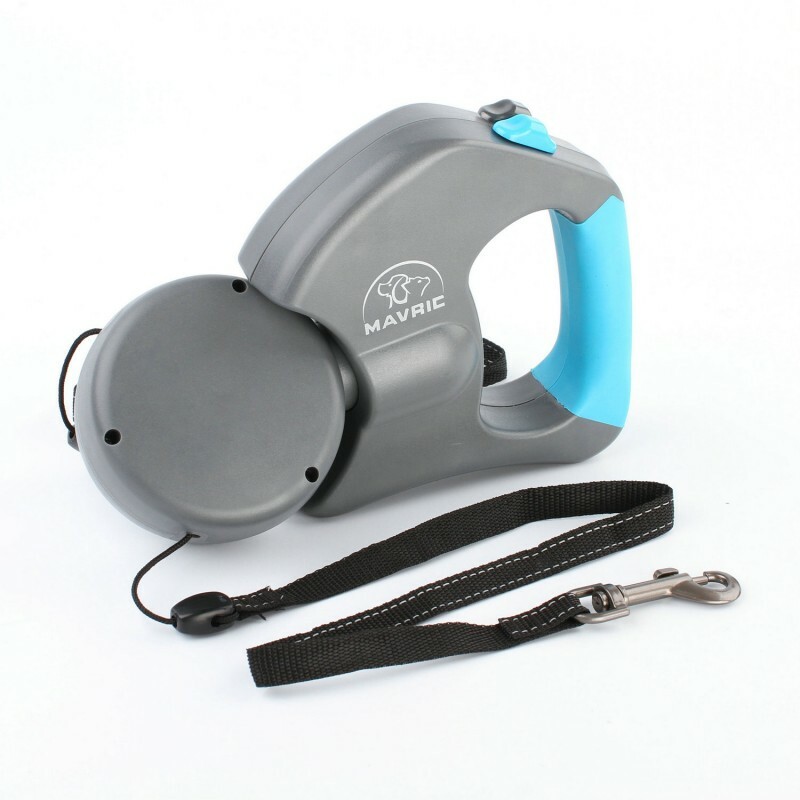 Dual retractable dog leash is suitable for all breeds of pets up to 66 lbs per dog and can be extended to 11 ft.
Prime ABS plastic coating, strong nylon strap with non-rust zinc alloy hook are highly quality controlled, all details follow US and EU standards ensuring great security and consistent control. Anti-slip handle offers soft touch and user-friendly using experience. 2 separated colored buttons control 2 dogs individually. One-hand break-and-lock design will increase your convenience. Designed for 2 dogs’ family to solve the dogs walking problem, our patented automatically untangled mechanism has been proved to be a useful development. No more worry about twisted leashes, which might hurt your precious dogs. You pets can enjoy unlimited exploration as well. -Material: ABS coating, nylon strap, zinc alloy metal parts. -Color: Grey coating with black straps. -Keep dog walking leash away from fire and kids under 3 years old. 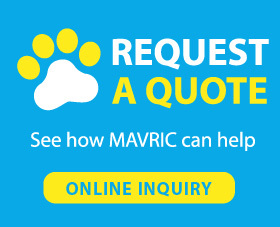 -Mavric, a professional pet products manufacturer, offers all kinds of leashes and collars for dogs. 1 year warranty is offered by us. If you have any question about pets or products, please feel free to contact with us. Why choose retractable dog leash for 2 dogs? Because that is a great choice for multiple pets walking. Imagining that walking your beloved 2 dogs with two leashes controlled by each hand, and dogs are active in outdoor, so they keep on smelling and walking around without caring your feelings. You feel exhausted but when you finish walking and go back to home, you find 2 leashes twisted together and you have to take several minutes to untie the leashes. What a terrible walking experience! But with our retractable 2 dog leash, you will feel much easier in dog walking. No more twisted leashes, as our design is tangle free. You pets can feel free to run and have fun. Our design can let you control 2 dogs individually by using only one hand. That ensures increased convenience for you. With such a good leash, you don’t need to find an off leash dog park. Don’t hesitate to get one for trying, a better walking experience is waiting for you! OBSESSED with this! My two dogs always switch sides on walks and I'm constantly trying to untangle them. This leash is a life saver! There is a built in device that allows them to switch back and forth all day long without tangling. I also love the leash length. I have one older dog that likes to walk slow and a young dog that likes to roam. This allows them to each keep their own pace, with me somewhere in the middle. It also has locks, so I can lock it into place when we get to corners or near other dogs, so they don't run into the street or assault innocent bystanders. I'd give 10 stars if I could. Best double lead I've ever used! This is a great double leash. Allows for greater control of my schnauzers while allowing them more freedom to roam. My pups are very strong for their size and this is the first mechanical lead I've used that I didn't feel I had to worry about the lead breaking when the pups take off after a squirrel. Also easy to use with one hand, which is necessary as I use a cane to help me walk. The spinner portion helps prevent tangled leashes, although for those already unsteady on their feet you should be aware that dogs with wanderlust (i.e. Heel is not part of their vocabulary) don't get the idea that they shouldn't walk around you multiple times or that they should only stay on one side. When they do this, the leads can trip you up. You need to be proactive to prevent this before it causes a problem. What a great product. I have two small dogs that always Chris-Cross each other. This used to be a pain to keep untangling the two leashes. But this leash is just amazing it spins every time the line crosses. Walking the dogs is so much more enjoyable now. I want to add this leash is very well built and hopefully will last a long time. This leash is a life saver for walking my two dogs. Other people have complained about it wearing out or being difficult to manage one dog pulling while the other is going potty. I have had it for months without anything breaking and while you do have to click tension on and off (not just hold down the button), I have no problem snapping one dog off tension to let the other do their business. It's not perfect (I sometimes miss holding down the button instead of having to click it on/off), but it's definitely not bad, and being able to walk both dogs is too good to pass up. I bought this leash for my 2 dogs - 10lbs staffordshire terrier and 20lb basenji. We moved from house to apartments and would be doing alot more walking. This leash works great! We did buy a 2nd one and I did notice that one leash turns better than the other on the spinner part. If I didn't have this leash, I'd go nuts! I have one dog that walks steadily beside me and the other is all over the place. So this is a great leash for us. We have been using these for a couple months now - no issues at all. We walk 4-8 times daily using these leashes. So they are getting used alot.